The following article appeared in The Livingston Daily written by Jim Totten on October 14, 2014. To view the article, CLICK HERE. As a 140-pound teenager who joined the paratroopers during World War II and became a machine gunner, the odds weren’t in Don Burgett’s favor by a long shot. He said a machine gunner’s average life expectancy was three minutes, because once he fired, he became a target. The 89-year-old Marion Township man said paratroopers were paid more than other soldiers — $100 per month instead of the $35-50 for infantry — but were not expected to live very long. They parachuted into enemy territory and often were responsible for securing roads. “When you took off for your mission and your friends say good-bye, they meant it,” he said. Burgett recently self-published his four books about his service as a paratrooper in the 101st Airborne Division, known as the Screaming Eagles. His first book, “Currahee!,” was published in 1968 and was endorsed by President Dwight E. Eisenhower. His books are available on Amazon. Burgett will be visiting Blue Frog Book Store from 1-3 p.m. Sunday and will have autographed books available. 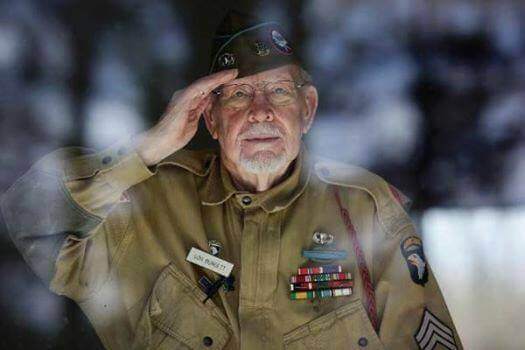 He fought through Normandy, Holland, Bastogne, Austria and Germany. Burgett returned to Normandy in June for the 70th anniversary of D-Day. He was awarded the Legion of Honor, which is France’s highest distinction. René Burgett-Powell accompanied her father on the trip, and said it was “crazy.” She said there were roughly 5 million people there. Burgett-Powell said the French honor the U.S. veterans and treat them with incredible respect. “Everyone wants an autograph, a hug, a picture,” she said. She said people have even stood up and gave them their table at restaurants. She said her father, who quit high school in the 10th grade, was the first enlisted man to publish a book about the 101st Airborne. “He was ahead of his time,” she said. With his almost photographic memory, Burgett doesn’t describe what happened to him during fighting so much as paints a scene. During a recent interview, he described the landscape of one battle and gave a minute-by-minute description of what happened. At Dead Man’s Corner, he recalled how he and four others fought off the Germans. The site was named after a American tank operator who was killed there; he was left there for days until the grave registry could pick him up. Burgett said he recalled the tank operator offering to help them before an anti-tank explosive killed him. Burgett soon found himself sliding down a hill to set up the machine gun in the road. It was dark, and the Germans didn’t know he was an American. When he started firing, German soldiers began scrambling up a hill. “I cut them and made a pile of them and another pile and another pile” Burgett said, pointing his finger back and forth to show how directed the machine gun. The Germans soon opened fired on him and fellow paratrooper Jim Hagenbuch. He said the bullets struck their gun, causing it to jump around and hit him. “I’ve been lucky all the time,” he said. He said his skills using a knife and gun probably helped him survive the war. He grew up in Detroit hunting and fishing with his father and brother. He knew how to shoot and skin a deer as a teenager. “Anything we killed, we ate,” he said, adding this was during the Depression. Burgett said paratroopers were tough but a little weird. He recalled when they were surrounded by the Germans at Bastogne. Burgett: You know we’re surrounded? Replacement trooper: Yeah, them poor bastards. Burgett: What do you mean them poor bastards. We’re the ones surrounded. Replacement trooper: We can just shoot in any direction and hit one of them, but they can only shoot in one direction and hit one of us. Even before he saw fighting, Burgett said his family made sure he had a handgun. He said his mother baked him a large date nut cake and sent it to him. “Usually the guys knew me and knew my mother made good stuff,” he said. Sometimes, he would return and find half of his package gone, eaten by his fellow soldiers. This package was untouched, but his friends encouraged him to open it up so they could eat it. While lifting the heavy date nut cake, he found a Colt 45 handgun underneath it, along with ammunition and a holster. Burgett kept that gun with him always, even when he was injured and went into surgery. Although he saw plenty of heavy fighting, Burgett doesn’t recall having an problems when he returned to U.S. What did he do? However, he said it took him a while to get used to home comforts; he couldn’t sleep in a bed for two years, and usually would sleep on the floor. Burgett hopes his books provide a legacy of his service. “You want something left behind,” he said.